I am a sucker for real-time strategy games. I have been ever since I was introduced to Command and Conquer my freshman year of college. I found myself playing that game for hours on end, much to the detriment of my grades. 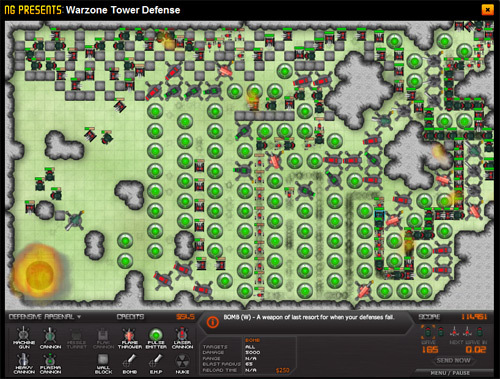 While I haven’t found a version of C&C in Flash, I did run across a Flash version of the tower defense strategy game, Warzone Tower Defense, an early forefather of real-time strategy games. The gameplay should be familiar to anyone who’s played tower defense before. The basis premise is that you have a base that you need to guard from enemy forces through the careful choice and placement of defense towers and other assorted weaponry. The objective of the game is to survive as long as you can, as the strength of enemy forces become progressively stronger. The graphics to Warzone is pretty good for a Flash game. It uses the standard isometric perspective, and runs rather well. After playing the game for a week, I’ve found a 2-part strategy that has proven to be quite effective in this game. While my strategy won’t earn you the crazy amount of points on the top 100 list, it will get you very high points consistently. Essentially, the idea is to create a maze using your towers that snake through as much of the screen as possible. For the ground forces, I found that the emitter units are your best bet. They have a uniform damage distribution and they dole out some serious punishment if aligned together as a series of walls. The second part of the strategy is to execute a “swing-door” maneuver. In the case of the default map, there are 3 natural entry points to your base. By closing off the middle path, you leave just the north and south gates as routes. The idea now is to wall off one path to force the enemy tanks to turn around and make their way to the opposite path. When they reach a sufficient distance from your other path, you sell that wall, and reopen it as a passageway, causing the enemy to turn around yet again. By opening and closing the paths in this manner, you can force the enemy to traverse the punishing emitter maze over and over again. This strategy requires excellent timing, but if executed properly, you can accrue some serious points, far more than some other approaches that I’ve tried.